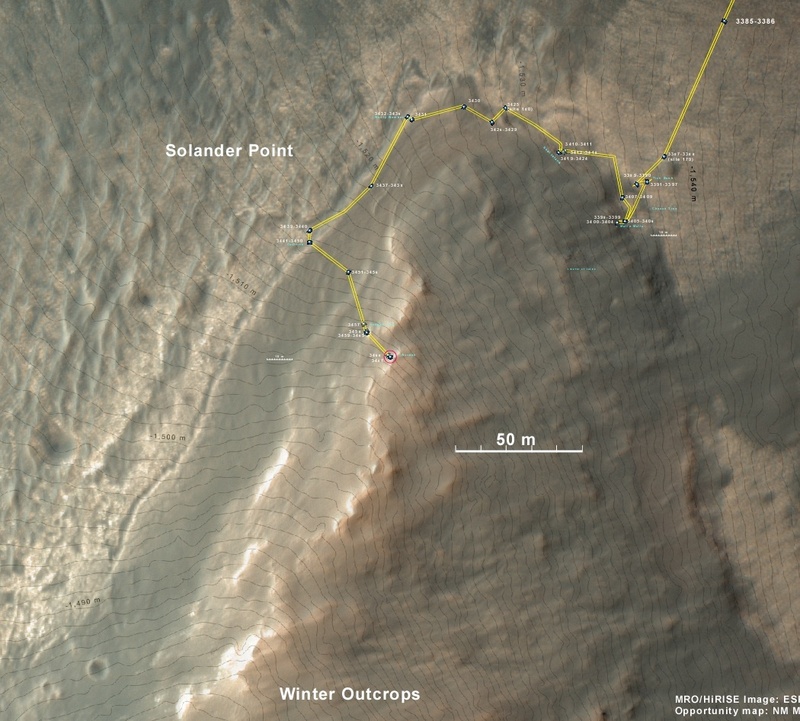 On sol 3451 Opportunity began its climb of Solander Point. This is the highest “mountain” that Opportunity has tried to climb yet. The nice thing about this climb is the fact that it is all on a slope that faces north. Opportunity is solar powered, so north tilts are better for power generation during the winter here just south of the equator. Above is a map of the current location of Opportunity on Solander Point. Note that we have driven around the north tip and are now ascending the slope and checking out outcrops as we go. MRO/HiRISE color image with digital elevation contours of 1 meter. Just before the climb started Opportunity was checking out the contact between the ancient Noachian rocks of Solander Point and the adjacent plain. There is a bright unit that is situated between the much later deposited sandstone plains of Meridiani and the much older crater rim rocks of Solander Point. This is just like what we saw back at Cape York. So here we wanted to do the same measurements of this outcrop that we did back on the outcrops at the north end of Cape York around sol 2989. Then we can determine if these are the same as the materials or something else. All our instrument so far say that it looks the same. So it is some sort of regional unit that was deposited after the crater rim was eroded, but before the Meridiani Plains rocks were laid down. This is real globally significant geology that we are doing on the ground. This Navcam view from sol 3441 looks east across the 22 kilometer-diameter Endeavour crater and south toward the ridge that Opportunity is climbing. Check out the bright outcrop material on the right that continues off into the distance. This is neither Meridiani sandstone, nor Endeavour crater rim materials, but something else in between the two in time. 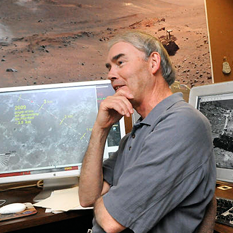 Currently Opportunity is sitting at the outcrops at the crest of the ridge and still climbing. The outcrop in this scene was the last stop two sols ago, an outcrop named “Kangaroo Paw,” where we did MIs and APXS analyses. In this Navcam panorama taken at its location of sol 3458 you can see the floor of Endeavour rater on the left. And in the far left distance the opposite rim of the crater 22 km away. What scene awaits over the next rise? Who knows! This is geographic exploration at its greatest. This mission gets more interesting day by day! Rovers are the best way to go!